You are a beginner or a triathlon pro? Aqualetics has the right offering for your personal needs! 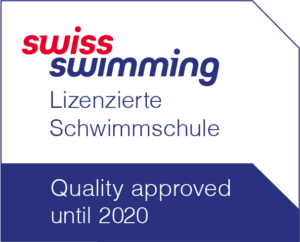 Swimming is very popular in Switzerland – and this is for a reason. It is not only fun but keeps you healthy, makes your body fit, strengthens your muscles, stimulates your blood circulation, and is therefore a foundation for all sportive activities. The wide-ranging Aqualetics courses offer a complete package for any adult. We have appropriate offerings for beginners, for occasional swimmers as well as for professionals – all our coaches focus on the individual needs of every participant. Want to learn how to swim? You did not have yet the opportunity to learn to swim or are you afraid of water? – Then you are exactly right here! Familiarize yourself with the water and learn the core elements of swimming. Build up your confidence and learn how to breath right in the water and the principles for safe swimming. You don’t know how to crawl yet or you are breathing like a hippo after 25 or 50m crawl swimming? Or you don’t like the neck cramps you get from breast stroke swimming? In the crawl lessons, our Aqualetics Coaches teach you tricks and tips you need to feel comfortable while swimming and to move efficiently in the water. You can swim 25m or 50m crawl but would like to improve distance and technique? In LEVEL 2 you fresh up the basics of crawl swimming before you optimize your own individual crawl style. Your goal is to improve your swimming technique, as well as your endurance? Then you are exactly right here. The individual optimization of the swimming technique is the focus of this training, combined with aerobic and anaerobic series. If you plan to participate in a triathlon or Gigathlon this training will prepare you specifically for your goals. You have been swimming for a longer period now and want to reach the next step? In swimming – but also in other sports – regular trainings with a coach is an essential element for continuous improvement of the specific swimming skills. Our Aqualetics coaches are highly educated and will be able to show you tips and tricks on how to more efficiently and effectively glide through the water. Quality before Quantity. Swimming is a technically oriented sport. With muscle power you will become a good swimmer, with technique you will become excellent. Our coaches are highly educated and specialized for adult education. Swimming effortlessly through the pool lanes feels better than fighting against the water. We will teach you tricks and tips for your well-being in the water. Swimming was often just swimming. Nowadays swimming hast much to do with athletics. Therefor we provide you in our lessons with exercises for prevention of back, shoulder, knee and foot problems.